Not until coming to the United States did Keyri Lopez-Godoy begin to enjoy school. 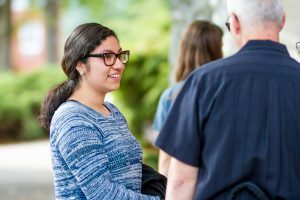 In El Salvador it had been just something she had to do, but after her parents brought her to the U.S. when she was eight years old, it was a requirement that she came to love, thanks to a litany of encouraging teachers. 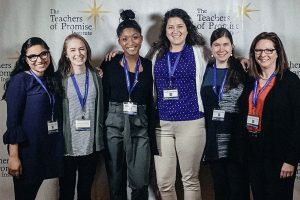 This spring, so many years later, Keyri (pronounced “Katie”) has been back in the elementary school classroom, this time as a student teacher, offering students the same “strength and oomph” that has fueled her own journey. 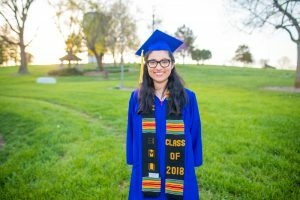 And even though for years college was an unfamiliar word, Keyri will graduate from Eastern Mennonite University on May 6 with a degree in elementary education. Along with nine others, she will wear EMU’s Cords of Distinction in honor of her impact on the EMU and local communities. 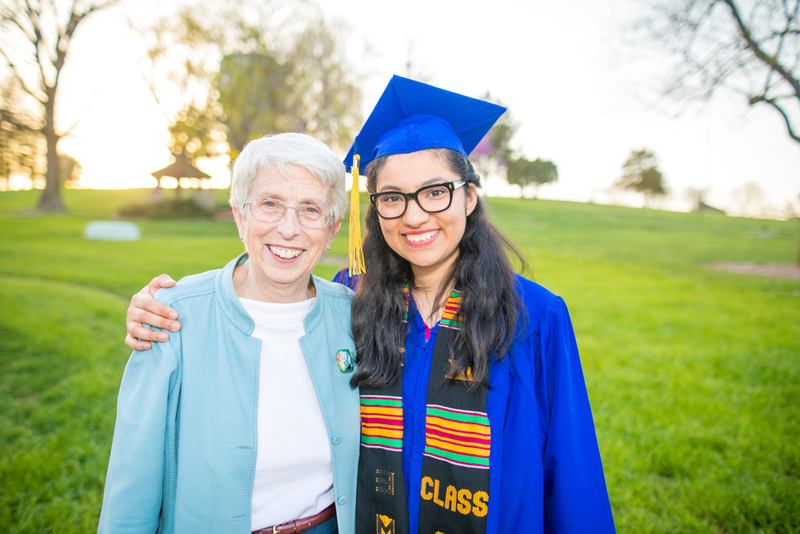 Keyri Lopez-Godoy “is truly an inspiration,” said education professor Cathy Smeltzer Erb. That perseverance and support has resulted in a chance to give back – in an anticipated position in a local elementary school beginning this fall. Watch WHSV coverage about Keyri Lopez-Godoy. Adjusting to the new environment, though, took time, and a celebration at the end of her fifth-grade year caught her off guard. That day was “strange,” she remembers, as the classroom filled with grandparents, relatives and parents. Her own parents, though, weren’t there. The whole family was still figuring out the new education system, and even she hadn’t realized there would be a “graduation” ceremony. “I remember just feeling lonely,” Keyri remembers, until her teacher came over to her with a gift and a letter. 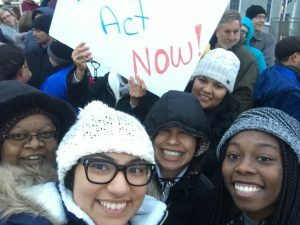 When she showed her mother an application for a college preparatory support class, however, her mom explained why she would not be able to attend college: she was undocumented. Though the moment was “probably very hard for my mom,” Keyri said she was not to be discouraged. That year, she “worked and worked as hard as I could,” and started taking more challenging classes. In eighth grade, she took a ninth-grade algebra class, and “struggled – but made it through” thanks to math tutoring that her teacher and principal arranged. Every morning for an hour before school, she met a tutor, Louise Gallagher, and when Keyri learned that the work had brought her grade up to an A, she ran through the school to find her. In high school, she began taking even more advanced courses, but still wasn’t satisfied. Yes, she could – but that option, Advanced Placement (AP) courses, for college credit, revealed a twofold disadvantage. Keyri Lopez-Godoy speaks with EMU university campus pastor Brian Burkholder following a chapel service about DACA. “That was the strength and the oomph, the confidence booster that I needed to say, ‘I got this,’” Keyri remembers. It took her all morning to finish, but she passed the test. Ultimately Keyri earned enough college credits through high school AP courses that she’s finishing her bachelor’s degree at EMU in three years, not the typical four. That year – 2012 – also marked an opening of possibility for Keyri through the Deferred Action for Childhood Arrivals (DACA) program. It allowed people brought to the United States as children and without documentation to reside, work and study legally here under renewable two-year permits. Keyri would go on to be accepted into six colleges, but wasn’t sure how to pay for this next step. DACA, after all, didn’t qualify her for federal financial aid. One of those six colleges in particular – EMU – seemed determined to help work out the money, though. And, her high school counselor Keri O’Connor told her about the Emily Couric Leadership Scholarship, worth $30,000. 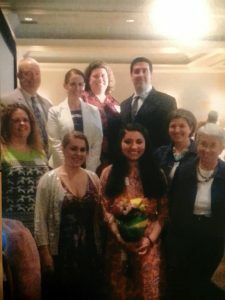 “And this is where I also go back to relationships,” she said: Not only was she nominated for the scholarship – each area high school could nominate just one female student – but the administration team at her school helped her prepare for the interview, in front of 20 people in downtown Charlottesville, Keyri said. Another school counselor bought her an outfit for the interview. The principal Jay Thomas pulled together a team of teachers and community members for mock interviews. And on the day of the interview, O’Connor came to her house to take her. That evening, when she received the phone call congratulating her for being chosen the scholarship winner, she and her mom both started crying, there in their kitchen. So did her dad, when he came into the room, even though “my dad never cries,” she said. Thank you for this inspiring story of Katie’s journey. While the pain of losing someone who has influenced many students, to know their influence lives on is comforting. Keyri is a delight. We are blessed to have her here at EMU. She will make a wonderful teacher.